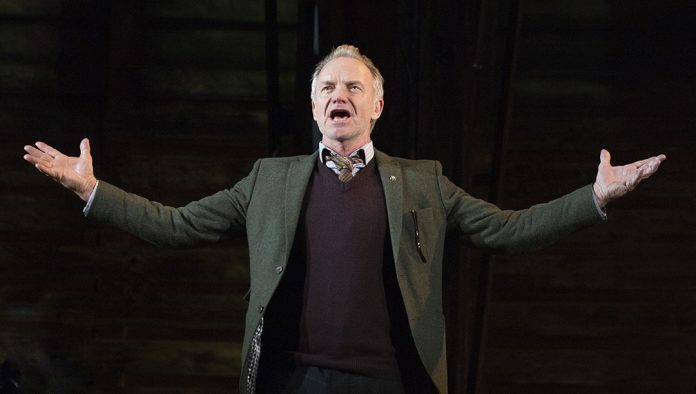 Musician Sting will be showing Oshawa and Unifor – the union which represents autoworkers at General Motors (GM) – some love Thursday with a sold-out performance of his musical The Last Ship at the Tribute Communities Centre. Tickets were free for Unifor members, who were given priority access, after which the general public was able to access admission to the show. The Last Ship, is currently being staged in Toronto, starring Sting, the lead vocalist of 1980s supergroup The Police. Sting agreed to perform in Oshawa and cast members of the play volunteered to join him, after hearing of the plight of GM workers. In November GM announced the Oshawa plant will close at the end of 2019. This left the city devastated as it will affect more than 2,600 GM workers and families. Since the announcement, many unionized workers have rallied to support Local 222. Some Oshawa residents also put up signs on their lawns with #SaveOshawaGM on them. “Sting witnessed first-hand what becomes of workers and their families when the core industry is ripped away,” says Jerry Dias, national president of Unifor, in a press release. The story of The Last Ship mirrors that of the GM situation. It is set in the shipbuilding community of Newcastle, U.K. and is based on a true story, one Sting experienced himself when he was a child. When a young man returns home after 17 years at sea, he is shocked to discover the local shipbuilding industry is closed. The community rallies together, fearful of their uncertain future. In an interview with the Toronto Star, Sting said he wants to “support a community in crisis” and that “support is important”. The show will begin at 12 p.m. tomorrow and will be livestreamed on Unifor Canada’s Facebook page.